⇒ Time-consuming single step debugging is a thing of the past. 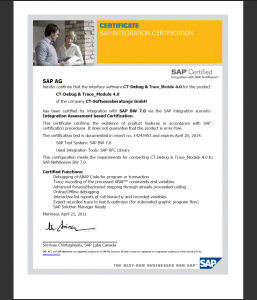 With the CT-Debug&Trace module, you can automatically record the processed program flow of ABAP® programs and transactions and can then analyze the program flow at any time (even during debugging sessions). You can archive the trace recording of programs, transactions, function modules, methods, and so on and can analyze it later (after a week, month, year …) using the values for the relevant variables (to check program changes, for maintenance, documentation …). Increasingly, company compliance rules call for the use of certified software. In addition, using certified software simplifies regular system checks by internal and external auditing bodies, e.g. government tax audits, external audits, internal audits. rate on the really important coding lines. So, leave the routine debugging to your PC. It is a lot quicker than you (much quicker , approx. 1000 – 1500 debugging steps/min.). You can stop the automatic debugging and carry on with manual debugging and change back to the automatic debugging at all times. Because every machine or manual step is documented, an analysis of the previous debug steps is possible. Additionally, all processed source code lines are marked, so you can see which line was executed and which not. 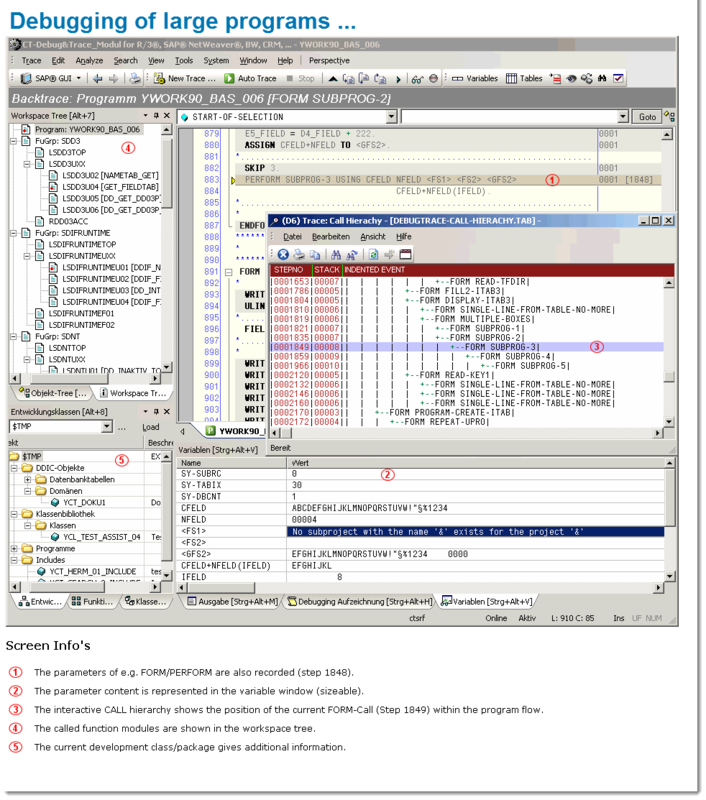 Optionally, the synchronized SE38 debugger screen (classic ABAP Debugger) is made available at the current coding place. The CT-Debug & Trace_Module makes an offline-trace available on the frontend PC. You are thus able to step forward & backwards through already processed coding parts and at the see the corresponding contents of the processed variables at that time. The variables of each processed coding lines are automatically determined. Then two snapshot of these variable are carried out: Before and after the execution of the coding line. So changes of the variable content are automatically recognized and also part of our trace documentation (max. 24 variables/command). If you for example want to test if certain subroutines (FORMs, FUNCTIONs, METHODs etc.) were correctly executed, just have look at the trace documentation: All subroutine parameters (single fields, structures) before and after the call were saved. The transcription of your debugging session will be supported considerably through 11 debug profiles. You control through a choice of a suitable profile the details which are recorded during the debugging session. You can for example let the CT-Debug&Tracer record each executed ABAP source lines (single step), or you can e.g. just record all subroutine, function module and method calls (with their parameters). 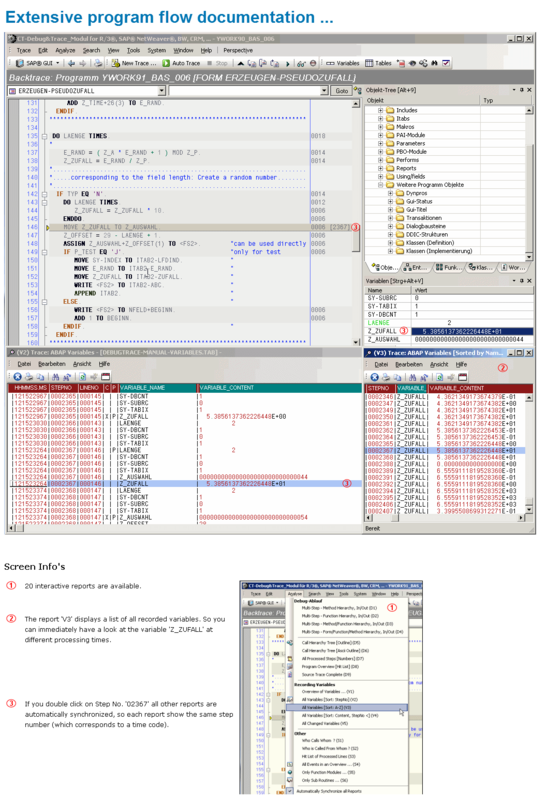 The program flow of large programs (e.g. transaction) is made transparent and important events and variable contents can be easier identified (compared to the classic . You can also record only certain ABAP source code parts of a transaction (shown in our manual – section ‘Tips & Tricks’). An example would be the processing of only one given transaction screen or a special user exit. After reaching the desired source code include, just use one of our debug profiles to process it and document every step (with the contents of the variables). Central component of the trace data analysis is the integrated report engine which was designed to handle large amounts of trace data. One important report is the debugging tree, which gives a quick hierarchical overview on the recorded debugging session (processed FORMs, FUNCTIONs, METHODs …). With a double click on a tree element, you can jump to more detailed data. In the analysis mode more than 20 interactive reports are offered, and all reports are synchronized with the recorded debug session (cockpit information)..
7. 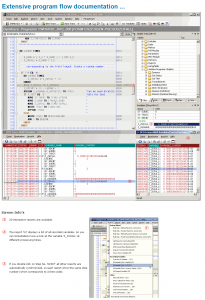 Type & coverage of the documentation of a debugging session …. During an automatic debugging session of approx. 10 minutes, you can e.g. automatically document more than 10,000 single program steps, by using our single step trace profile. Additionally, approximately 20,000 variables with their contents (and content changes!) are recorded in that time. No user activity is necessary here. 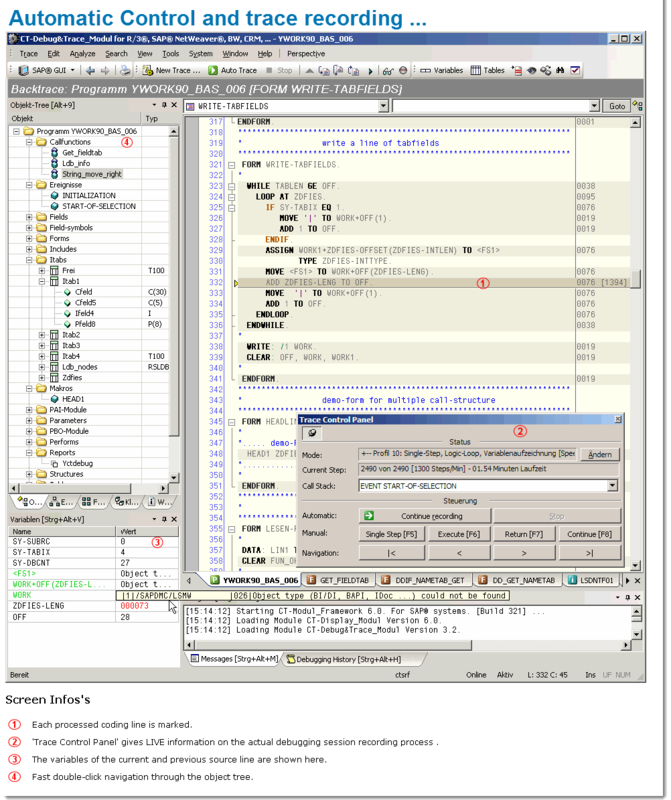 At the same time all processed ABAP coding member from the application server program library (e.g. 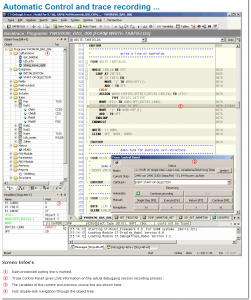 100 ABAP includes, when tracing approx. 30,000 coding lines) will be stored in our offline database for later analysis, control and documentation purposes. So you will get a consistent documentation of the program flow. The processed source code lines are marked in color and additionally are synchronized with all our interactive trace reports. Through the auto-debugging feature (with is control through debug profiles), you can process your program and extensively test it in a short time. 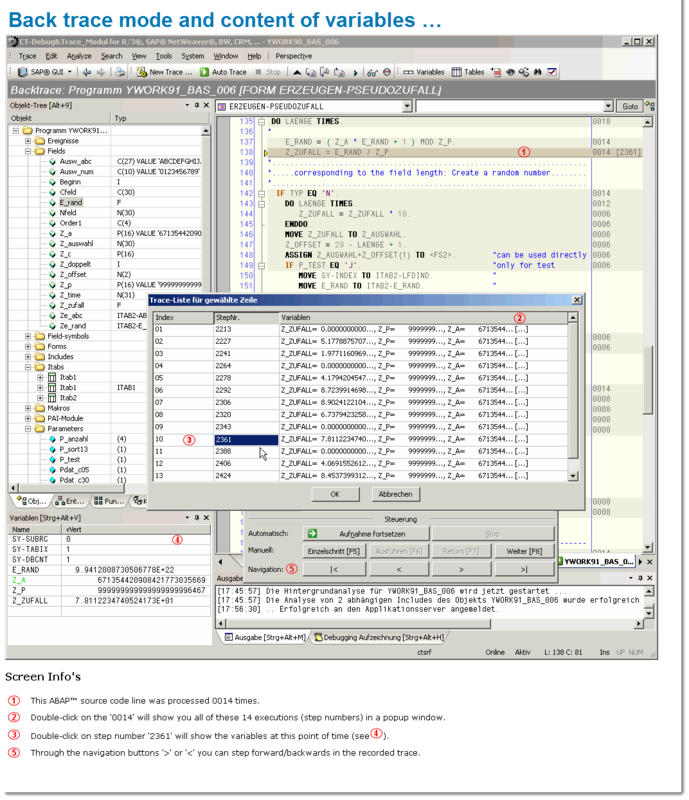 The automatic documentation of each debugging step can later be added to the technical program documentation as a test protocol. It is therefore possible, at a later time , to browse forward and backwards in the offline-mode. You will an interactive documentation of your program flow at a specific time, which can be (re)processed at any time in the future (without any connection to the application server). So if an ABAP® source is changed or deleted in the future, the trace documentation will stay consistent. This followed by an analysis which is supported by the dedicated reporting features. Also consideration has to be given, that the complete program flow is automatically part of the documentation, which includes access to control, master und other data tables and the used test data. You can then process the exact recorded program flow at any time with our offline trace feature. In contrast: It is often quite difficult to reproduce the exact program flow manually (e.g. database tables were updated during the last test run). 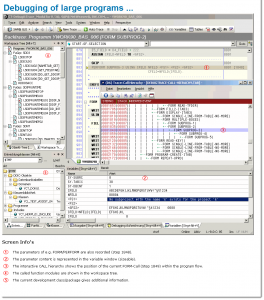 In theory, even “small” ABAP programs can process more than 100,000 individual steps (e.g. SELECT, DO, WHILE, LOOP). If you want to analyze part of an ABAP program that is of interest to you, you can actively change the level of detail of the trace during the debugging session. More than 10 debug profiles are provided for this. You can locate a program error relatively quickly (multi-step profile) and then record the problematic section of code automatically using a single-step profile. 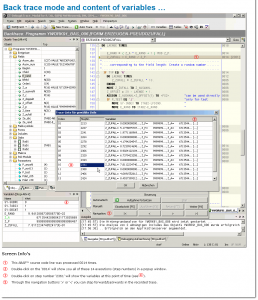 You can then analyze the code with the help of 20 interactive reports. 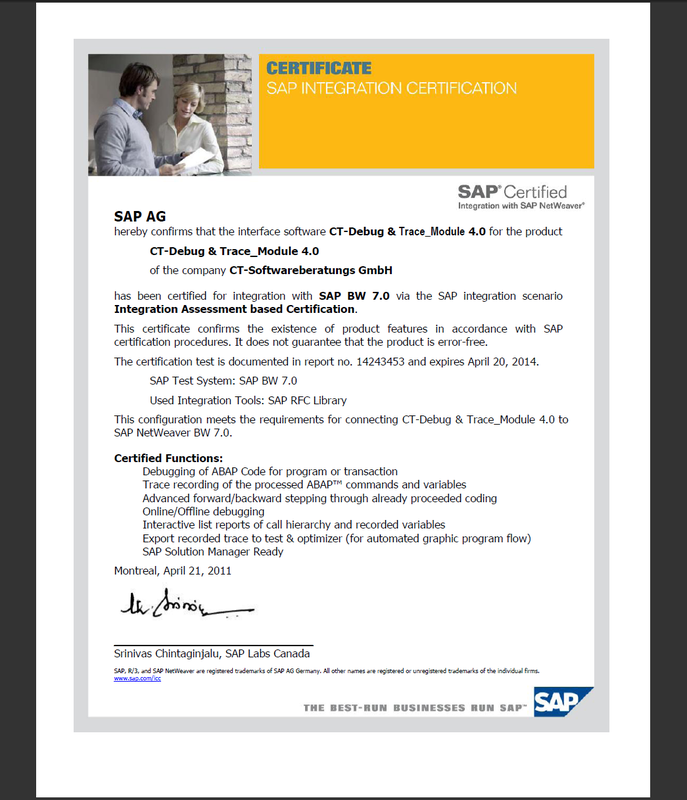 SAP SE certified the software solution ‘CT-Debug&Trace Module’ on 21.04.2011.